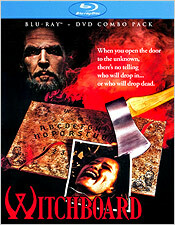 Witchboard was originally released in 1986 and had a nice return, especially on home video. It’s also Kevin Tenney’s first film, prior to his more popular horror film Night of the Demons. The film stars Tawnee Kitaen, who most might recognize from Bachelor Party or Whitesnake’s “Here I Go Again” music video, as well as Todd Allen and Stephen Nichols in supporting roles. Now, I wouldn’t go so far as to call Witchboard a great movie, or even a great horror movie. It’s definitely got a lot going for it, but it never quite peaks in my opinion. Instead of outright horror, it focuses more on terror and atmosphere more than anything. The film’s plot involves a woman that begins talking to the spirit of a dead child through the use of a Ouija board. The spirit initially seems to be friendly, but soon becomes increasingly violent, murdering everyone around both the woman and her husband. The main thing that Witchboard is known for, as opposed to Night of the Demons, is its pace. Under the right circumstances, I would prefer a movie that takes its time, but there are too many variables involved with this project that make feel like maybe it shouldn’t have been executed that way. The subject matter seems to call for quicker cuts and a faster pace. A bit more punch is needed for the proceedings with more horror happening on-screen. As a consequence, it tends to feel more like a Lifetime TV movie than a horror film. So it’s very lax and it takes its time, which is a detriment in this instance. It’s not a terrible film at all, it just needed a little more drive to keep things interesting. You can only look at Tawny Kitaen for so long, you know... or maybe not. Whatever my reservations may be about the film’s content, Witchboard’s Blu-ray debut is still very much welcome. Scream Factory’s transfer of the film to high definition is very good, but does have some minor problems. When it comes to the quality, there isn’t as fine amount of image detail as you could ask for, but there’s still a very pleasant and unobtrusive grain structure on display. The color palette looks very nice, but without much of a style into it, it looks a bit mechanical to me. Skin tones look pretty good most of the time, not being totally accurate. Black levels are nice and deep with some good shadow delineation, and both brightness and contrast are good (although the images did appear a bit underlit to me at times). There are also some minor problems, mainly with the first ten minutes or so of the film. The opening credits, for instance, are very unstable, showing evidence of telecine wobble. The rest of the film has this wobble to it, but it’s during the credits that it’s the most apparent. There are also a few film artifacts here and there (which is ok to me), as well as some compression artifacts (mainly in those first ten minutes). The good news though is that I didn’t perceive any digital tampering. So this is a very good transfer that’s not perfect, but it should please most viewers. The soundtrack is presented in an English 2.0 DTS-HD track, which is also very good without being overly great. Dialogue is always audible and clear, but the sound effects and score can sound a bit harsh at times. There also isn’t much in the LFE department either. And being that it’s stemmed from a mono mix, the soundtrack doesn’t have much range from left to right and vice versa. It’s good enough for what it is, but I think a 5.1 track could have been utilized for this one. Subtitles are also included in English for those who might need them. The most positive aspect of this release is its extras, which are plentiful. There’s an audio commentary with writer/director Kevin Tenney and actors Kathleen Wilhoite, James W. Quinn and Stephen Nichols; another audio commentary with Tenney, producer Gerald Geoffray and executive producer Walter Josten; the Progressive Entrapment: The Making of Witchboard documentary; the film’s theatrical trailer; six vintage sets of interviews and featurettes (Making of Witchboard, Cast Interviews, On Set with Todd Allen and Stephen Nichols, On Set with the Makers of Witchboard, Life on the Set, and Constructing the World of Witchboard); a set of outtakes; a behind-the-scenes gallery; and finally, a promo gallery. There’s also a DVD version of this disc included, as well. With all this content, there should be plenty here to keep fans and newcomers alike busy for a couple of hours, at least. Overall, Witchboard on Blu-ray is a welcome addition to any horror fan’s library. I know I have some things about it that I don’t like, but if you’re tired of running circles around slashers and monster movies and you’re looking for something a little more subtle and unsettling, then this release should satisfy you.